Reply headed 'Advice for Mrs Campbell', neat draft bearing initials 'G G' and 'I H' [Dr. John Hope] (but not their signatures, so possibly a copy made by a secretary). 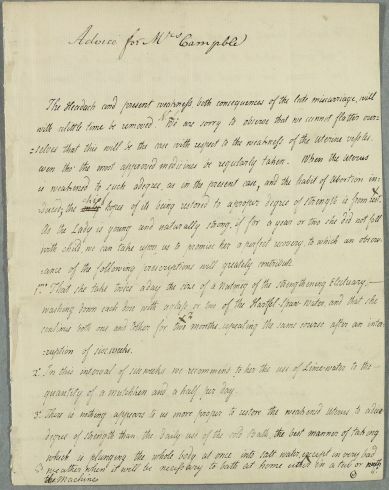 This is a joint consultation annotated by Cullen to indicate his editorial suggestions [see Letter ID:793 which was the cover letter Cullen sent Hope]. Gives directions for Mrs Campbell's care given her history of miscarriages, and suggests that 'if for a year or two she did not fall with child, we can take upon us to promise her a perfect recovery'. 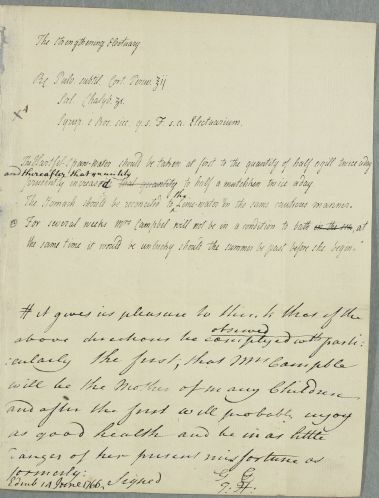 Summary Reply headed 'Advice for Mrs Campbell', neat draft bearing initials 'G G' and 'I H' [Dr. John Hope] (but not their signatures, so possibly a copy made by a secretary). 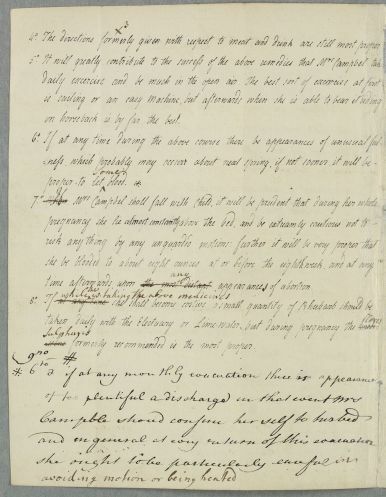 This is a joint consultation annotated by Cullen to indicate his editorial suggestions [see Letter ID:793 which was the cover letter Cullen sent Hope]. Gives directions for Mrs Campbell's care given her history of miscarriages, and suggests that 'if for a year or two she did not fall with child, we can take upon us to promise her a perfect recovery'. Case of Mrs Campbell who has had several miscarriages and who is diagnosed as having a 'weak uterine system'. [PERS ID:483] Patient's Physician / Surgeon / Apothecary Dr G. G.
[PERS ID:483] Supplemental Author Dr G. G.
ance of the following prescriptions will greatly contribute. quantity of a mutchkin and a half per day. 4o. The directions formerly ✍↑X 3↑✍ given with respect to meat and drink are still most proper. on horseback is by far the best. time afterwards when the most distant ↑any↑ appearances of abortion. icine (↑✍sulphuris↑)✍ formerly recommended is the most proper. avoiding motion or being heated. Take two ounces of finely powdered Peruvian bark and one drachm of Chalybeate salts. Add a sufficient quantity of Rose syrup and let it be artfully made into an Electuary. ↑✍and thereafter that quantity↑ ✍prudently increase✍d✍that quantity to half a mutchken twice a day. The stomach should be reconciled to ↑✍the↑✍ Lime-water in the same continuous manner. the same time it would be unlucky should the summer be past before she begin. 1: Context suggests this refers to the use of the indoor shower-bath, consisting of a tub suspended from the ceiling by ropes and pullies which Cullen frequently promotes. 2: General term for a horse-drawn vehicle. ✍[Start of margin text]X4[End of margin text]✍ Syrup. e Ros sice q. s. F. s. a. Electuarium.